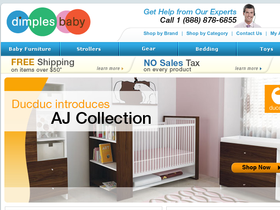 Visit Dimples Baby online at DimplesBaby.com for strollers, baby gear, baby furniture and much more. Dimples Baby carries top name brands such as Aprica, Chicco, Britax, Graco, Oeuf, Maclaren, BubmbleRide, HarperCollins, We Sing, Tiny Love, Bloom, Baby Angel and many more. Save on your next purchase from DimplesBaby.com with Dimples Baby discounts, Dimples Baby coupons, Dimples Baby promotions and Dimples Baby savings from 58coupons.com. Check out DimplesBaby.com and you can get free shipping on your orders over $50. Use this exclusive 58Coupons code on Dimples Baby and you can save 10% off your order of $250 or more. Act now and take advantage of a 15% discount on your order of $1000 or more from DimplesBaby with this exclusive coupon code from 58Coupons. Shop for your crib and DimplesBaby and enjoy free shipping on all cribs plus 10% off select cribs. Click link to start shopping. Click link to check out the wide range of double strollers available on Dimples Baby. With brands like Maclaren, Peg-Perego, Graco, BOB, and more, your sure to find one you and your babies will love. Change your baby on a new changing station from DimplesBaby.com, now from only $185, plus they ship for free!